1. 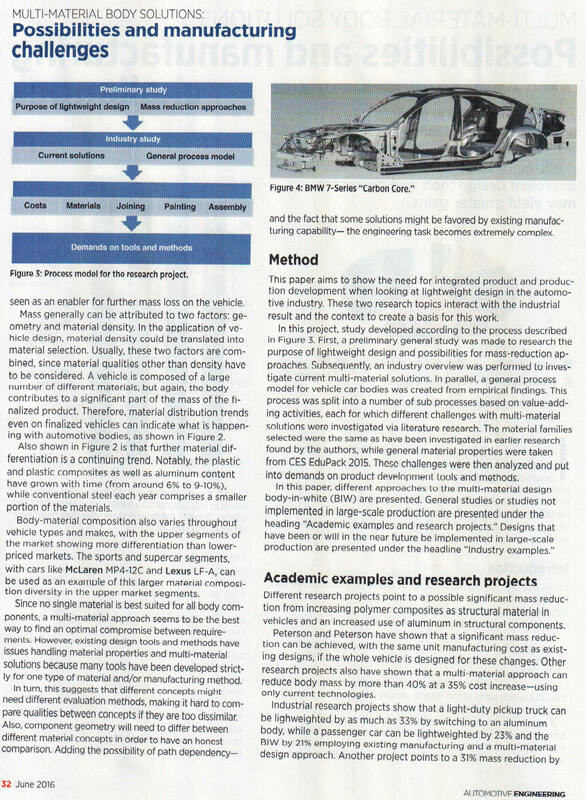 Fiber Reinforced Polymer (FRP) materials: Click on FRP for a sample research ATC has conducted for a client. Part I: What Is A Composite Material? A composite material is a macroscopic combination of two or more distinct materials having a discrete and recognizable interface separating them. The combination produces properties that cannot be obtained with either constituent acting alone. Examples are reinforced concrete, wood, and polymer composites. Usually, a composite consists of a matrix and fillers. In the case of carbon fiber reinforced polymers (CFRPs), the matrix is a polymer (resin) and the fillers are small carbon fibers. The morphology and distribution of the fillers in the matrix is one important parameter determining the properties of the composite material. Figure 1 shows possible ways fillers can be shaped and mixed with the matrix material. Historically, the Pharaohs of Egypt and the ancient Incan and Mayan civilizations practiced the usage of plant fibers for strengthening and preventing bricks and pottery from cracking. Several matrix materials such as metals, ceramics, and polymers have been used. The purpose of the matrix is to bind the fibers together, transfer load to and between fibers, protect fibers from environments and handling, distribute the load evenly amongst the fibers, and to provide the interlaminar shear strength of the composite. The matrix generally determines the overall service temperature limitations of a composite material. Consider a laminate made of CFRP composite. If it is pulled at two ends, a tensile stress, defined as the force of the tension divided by the laminate’s cross sectional area, is applied to the material. The measurement of how much the part bends or changes size (in this case, changes in length) under load compared to the original dimension or shape is called strain. Strain applies to small changes in size and is defined as: [(final length - original length) / original length] = Change in length or deformation divided by the original length. In the elastic region of the material behavior, the tensile stress is linearly related to strain with a proportionality constant known as Young’s tensile modulus of elasticity (E). The larger the value of E, the stiffer the material is. The maximum strength of a material without breaking when the load is trying to pull it apart is called “tensile strength”. A good way to visualize this property is to think of pulling a fresh marshmallow apart and then pulling a piece of taffy apart. The force or pounds required to pull the taffy apart would be much greater than required to pull the marshmallow apart. If that force is measured and the taffy and marshmallow each had a cross-sectional area of one square inch, then the taffy has the higher "tensile strength" in terms of pounds per square inch. One popular type of composite material uses a polymer matrix with glass fibers. Glass fiber composites of all descriptions have found extensive and successful applica­tions including low-performance non-structural applications as well as high-performance struc­tural applications. The applications range from the building construction trades, to auto, truck arid rail transportation, seagoing applications including high-performance racing craft and commercial and military aerospace. Specific applications involve, decorative panels, appli­ances, ship and boat hulls, light aircraft and glider construction, nearly all forms of recre­ational equipment, high-pressure gas containers and rocket motor casings. This wide spread use of glass fiber-reinforced organic composites and their continued future growth is due to many factors, including: cost, availability, handling and processing ability, useful properties and characteristics and past good experience in service. The glass fiber, a popular one, that is the industry standard is E-glass, which is a calcium aluminoborosili­cate formulation having very good mechanical and electrical characteristics at very reason­able cost. Average mechanical property levels for individual filaments are 3450 MPa (500 ksi) for tensile strength and 72.4 GPa (10.5 x 106 psi) for Young’s modulus. Extensive research has been conducted to develop glass fibers possessing higher strength and stiffness characteristics. Glass formulations producing filaments of increased strength and stiffness have been found to be toxic (beryllium glasses) or very high melting and difficult to handle in com­mercial scale equipment. S-glass fibers contain a higher percentage of alumina compared to E-glass. Filament strength, modulus and melt­ing point are higher than E-glass. Typical filament strength and stiffness for S-glass are close to 4600 MPa (670 ksi) and 85.5 CPa (12.4 x 106 psi). Here, we would like to demonstrate what can be achieved by formation of a composite material and it is explained through an example using glass-fiber polymer-matrix composite materials. Fibrous materials such S-glass, (Kevlar 49) aramid, Spectra, boron and the many types of carbon fibers produced commercially possess specific properties (strength/density) and (modulus/density) many times greater than structural alloys of aluminum, titanium or steel. However, when the fibers are combined with a matrix into a near quasi-isotropic lay-up, a highly useful engineering form of the material, the specific properties are greatly reduced but are still superior compared to conventional homogeneous metallic materials. Figure 2 shows the strength- and stiffness-to-weight (i.e., specific properties) relationships for several fibers when arrayed in unidirec­tional laminates. These are calculated values based upon literature fiber values and 65 vol.% fiber content. It can readily be seen that these high-performance fiber materials form the basis for the advanced composites technology. 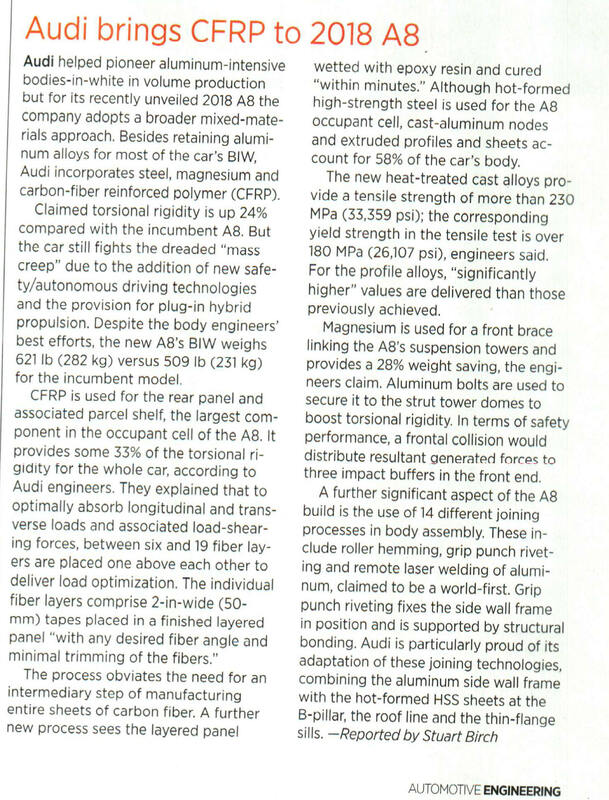 Fiber composites are both lighter and stronger than steel. They can also be stiffer than steel depending on the fiber used. The wide variety of materials that can be combined to form com­posites having highly acceptable levels of engineering properties can make the selection of specific materials a challenging task. In Part II of this series, some other types of composites are discussed with specific applications in automotive industry. Figure 1. Changes in these parameters (i.e., fiber distribution, concentration, orientation, shape, and size) and fiber material change the mechanical properties of the composite materials. Figure 2. “Specific” tensile strength as a function of “specific” tensile modulus (indicating stiffness). A number of fibers (S-glass, E-glass, Aramid, Carbon, SiC, Alumina, and Boron) are shown. Table 1 and 2: Properties of fibers and typical composite materials using polymers used as a matrix material. Reinforcement refers to the type of fibers (or fillers) used. (MPa)* and (GPa)* are specific values. In part I of this series, we have discussed the basic construction of a composite material. 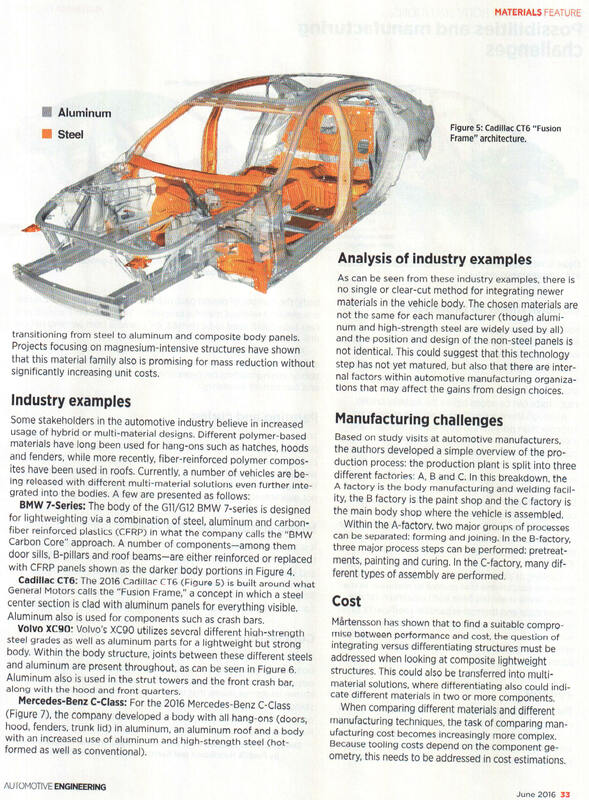 In this article attempt is made to present a select list of important applications of composite materials in automotive industry. Government regulations in the United States and Europe continue to demand for tighter restrictions on vehicle emissions. To meet these requirements, automakers increasingly turn to new technologies. Among these are lightweight materials such as plastics and composites. Also, it is interesting to see that as fuel economy standards increase, total vehicle mass and steel content decreases and are replaced by composite materials. E-glass remains the dominant composite reinforcement, but carbon fiber is becoming more popular as prices continue to decrease. All together, the transport sector notably accounts for about 25% of worldwide production of glass fiber and, cars produced in the United States can contain as much as 100 kilograms of composite materials, compared with slightly less than 30 kilograms for cars built in Europe. Processing methods depend upon the choice of the matrix material (thermoset or thermoplastic), the total volume to be produced, and the structural requirements. New interest in natural fibers is being driven by environmental regulations and advances in processing. Natural fibers include those of vegetable origin constituted of cellulose, a polymer of glucose bound to lignin with varying amounts of other natural materials. They include the hard leaf fibers such as abaca (Manila hemp), sisal and henequen (The leaves are stripped of their pulp mass, leaving thousands of monofilaments that are dried and baled for processing into mats); bast fibers from the soft bast tissues or bark such as flax, hemp, jute, and ramie; and seed-hair fibers including cotton, kapok and the flosses. For centuries they have been made into baskets, clothing, sacks, ropes, and rugs. They have even been smoked. Now plant-derived natural fibers (kenaf, hemp, flax, jute, and sisal) are making their way into components of cars. Natural long-fiber composites are aiming at glass-fiber composites due to the lingering health concerns about inhaling glass fibers which is contributing to the recent trend in their applications. It appears then that lightweight, strong, and low-cost, natural fibers are poised to replace glass and mineral fillers in many interior parts. In the last decade, natural-fiber composites of thermoplastics and thermosets have been embraced by both European and North American car makers for door panels, seat backs, headliners, package trays, dashboards, and trunk liners. Although natural fibers have benefited from the perception that they are "green" or environmentally-friendly, what is more important is their ability to provide stiffness enhancement and sound damping at lower cost and density than glass fibers and mineral fillers. Natural fibers are also being used in polyurethane composites. The first commercial example is the inner door panel for the 1999 S-Class Mercedes-Benz, made in Germany of 35% Baypreg F semi-rigid PUR elastomer from Bayer and 65% of a blend of flax, hemp, and sisal. The 2-mm-thick door panel is made by the new NafpurTec process from Bayer's Hennecke Machinery Unit, whereby a robot places natural-fiber mat in an open mold and second robot pours PUR over it before the mold is closed. The process is being used to make sunroof covers for some cars. 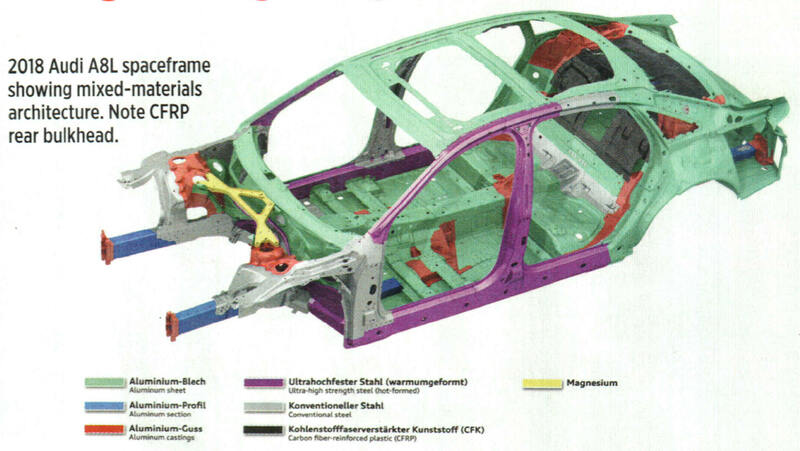 The matrix in most composite materials of use for automotive applications is usually made of polymers. There are generally two types of polymers; Thermoset and thermoplastic. The terms "thermosetting" and "thermoplastic" have been traditionally used to describe the different types of plastic materials. A "thermoset" is like a concrete. There is only one chance to liquefy and shape it. These materials can be "cured" or polymerized using heat and pressure or as with epoxies a chemical reaction started by a chemical initiator. A thermoplastic, in general, is like wax; that is, one can melt and shape it several times. The thermoplastic materials are either crystalline or amorphous. Advances in chemistry have made the distinction between crystalline and amorphous less clear, since some materials like nylon are formulated both as a crystalline material and as an amorphous material. Historically speaking, in 1953 the Mobile Plastics Division of Carlyle corporation introduced the first pre-impregnated roving. From 1953 to 1955 General Motors, working with Molded Fiberglass products Co., launched an exploratory program with its Chevrolet Corvette all fiber reinforced polymer (FRP) body. In the first production year, 300 were produced using vacuum bag, aerospace technology. 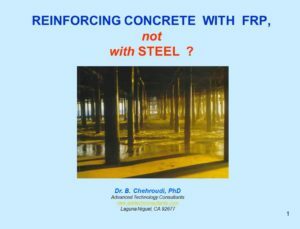 The success of the Corvette showed the advantages of using FRP in the fabrication of large complex shapes in relatively low volume. This giant step matured into 140 million pounds of FRP in automobile components in 1979. 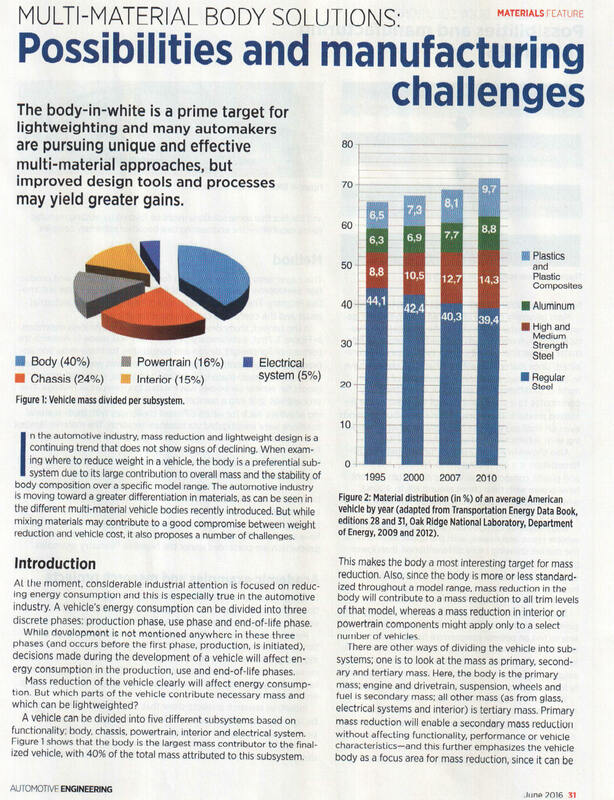 Primary reasons for conversion to composite material in automotive industry is weight reduction and lower cost, although other factors such as integration, noise reduction, improved styling, and overall part performance come into the equation as a secondary consideration. Although acceptable finished parts can be molded from variety of processes and materials, the compression molded sheet molding compound (SMC) and injection or compression bulk molding compound (BMC) are popular. Both products provide a wide range of physical properties and appearance characteristics enabling their use in diverse applications such as passenger cars, trucks, public transport, electrical and construction. SMC is a type of fiber-reinforced composite material which primarily consists of a thermosetting resin, glass fiber reinforcement, and fillers. Additional ingredients such as low-profile components, cure initiators, thickeners, process additives and mold release agents are used to enhance the performance or processing of the materials. 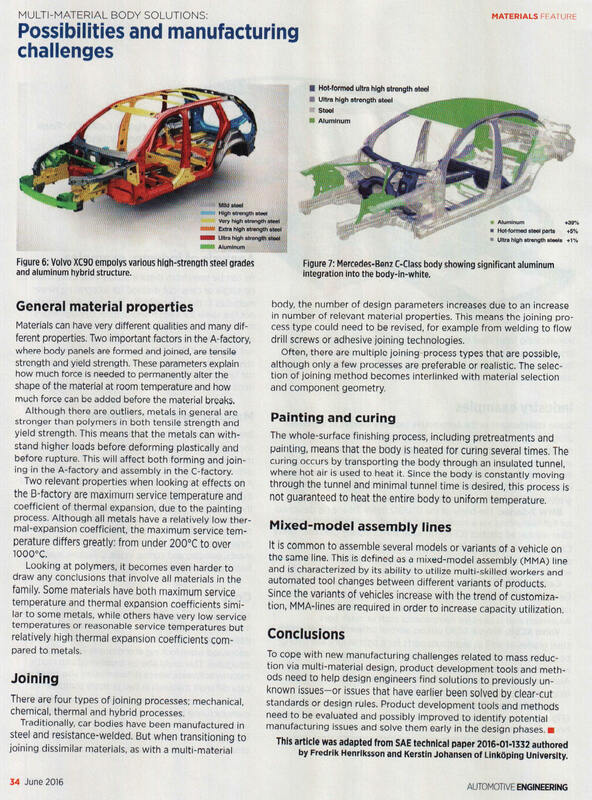 As with any material system, be it metallic or plastic, SMC can be formulated to meet specific performance requirements of a particular application, such as tensile loading or Class “A” surface where surface smoothness and reflectivity are paramount, such as exterior body panels, instrument panels, and interior trim panels. Class A specification arise because today products are not only designed considering the functionality but special consideration are given to its form/aesthetic which can bring a desire in ones mind to own that product. This is only possible with high-class finish and good forms. This is the reason why in design industries Class A surface are given more importance. For example, composite exterior body panels have undergone significant improvements in recent years, notably in the area of defect reduction, using new toughened resins, such as Atryl TCA from AOC LLC. The experience with this choice of resin and barrier coating for Class A panels proves ability to essentially eliminate paint pops. This has restored SMC as a viable option for more vehicles than before. New 2006 vehicles with SMC body panels include Cadillac XLR-V and Cadillac STS-V series; both incorporate styled composite hoods to accommodate larger engines. The Pontiac Solastice and forthcoming Saturn Sky roadsters have injection molded SMC tulip panels between the seats and the deck lid. Sky also features injection molded SMC front fenders. Jeep Wrangle will have in 2007 a removable SMC hardtop with built-in sunroof, plus long fiber reinforced thermoplastic structural door inner panels. The Honda Ridgeline pickup integrates a multi-piece SMC box with a built-in trunk compartment, capable of holding up to three golf bags and a good size cooler. The box surfaces are painted using a spatter process to provide anti-skid characteristics and UV protection. Carbon fiber continues to be of interest for high performance vehicles but recent supply constraints and higher prices are limiting its further application for production vehicles. Exposed carbon fiber, in which the woven pattern can be seen, continues in aftermarket tuner vehicles. BMW M6 features a roof panel molded in exposed carbon fiber using epoxy resin and the resin transfer molding (RTM) process. Others, such as Corvette Z06, Mercedes McLaren SLR, Lamborghini and Ferrari do use carbon fiber components. Manufacturers increasingly use the RTM process because it provides a moderate alternative between the high volume, large capital investment compression molding and low volume, low capital investment vacuum infusion molding. The RTM consists of a thermoset resin injected into a two-part matched mold containing a dry fiber reinforcement. The basic RTM process includes the loading of the preformed reinforcement into the RTM tool, closing the tool, injecting the thermoset resin into the mold, curing the resin, and removing the part from the mold. The dry fiber reinforcement, often called a preform, consists of a wide range of materials from natural wood fibers to synthetic polyester fibers. The automobile industry most commonly uses glass fibers, whereas the aerospace industry uses mostly carbon fibers. On important area of market penetration for composite material has been in the design of the intake system. Porsche was the first to experiment with the use of thermoplastics in the air induction system. In the early 1970s Porsche developed an application for its 911 model using DuPont Zytel glass-reinforced nylon PA 66 that incorporated the air filter box, mass air floe sensor mount, throttle body mount and plenum. Developed prior to the commercial use of the vibration-welding assemble process, the application featured a two-piece design joined with glue and bolts. The achieved reduced weight contributed to improved performance through an increased power-to-weight ratio for this engine. Introduction of port fuel injection (PFI) was a turning point for the application of composites in the intake systems. The PFI features a dry manifold as compared to the carburetor system where the fuel is wets a large portion of the intake system. If the engine backfires and caused the air-fuel mixture to explode, an aluminum manifold could withstand the event; however, thermoplastic manifold would not and result in its rupture. The PFI approach eliminated this explosive mixture in the manifold and greatly reduced the risk, making thermoplastics a viable solution. A number of variables may affect the peak burst pressure during a severe engine backfire such as, throttled volume of the intake manifold, the air/fuel ratio, possible leakage paths, type of processing method used (vibration welded vs. lost core) and material selection. The material strength at the weld joint of the vibration-welded design is weaker than the rest of the manifold because reinforcement glass fiber does not cross the weld boundary. The glass fiber tends to become parallel to the weld flange during the welding process, causing the weld joint to be only as strong as the base material. Research showed that intake manifolds made of PA6 has higher burst strength than those made of PA66. Another approach to backfire issue is to incorporate a backfire relief valve that relieves pressure during a backfire event. This type of valve has already been commercialized in some engines, notably Volkswagen. One of the challenges in designing a composite material intake system is to consider the temperature range covered by the need for exhaust gas recirculation (EGR) for NOx emission control in engines. DuPont and RAETECH Corp. addressed this issue in early 1990s with the development of a thin-walled tube called the EGR Isolator (EGRI), which commercialized on the 1993 GM 3800 V-6 engine. The component, made of glass-reinforced nylon, is used to attach the high-temperature EGR outlet tube to the intake manifold. The EGRI provides a large temperature gradient between the two elements. The outer tube directs heat to the surroundings and insulates the manifold from direct exposure to conduction, radiation, and convective heat transfer. Although the EGRI solves a narrow range of high temperature operation for low EGR levels (10-15 %), future levels of EGR gases of up to about 40% may necessitates new technologies to address this problem. Finally, combination of environmental issues and stricter fuel consumption requirements have encouraged manufacturers to undertake studies on reducing both weight and friction. In this area much attention is focused on metal matrix composite (MMC) materials, specifically, aluminum alloy composite materials for cylinder block because of improving material properties and reducing weight. Researchers and engineers have been seeking for the possibility of applying a new method where particulates, as modifiers, are added to molten metal in mass production. This is a subject of current research and has not yet reached a mature and practical level. Figure 1. 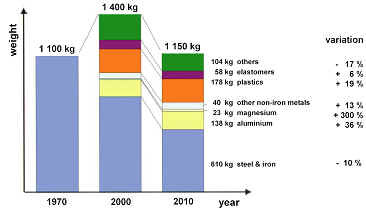 Indicates an increased total weight of a modern car (compared to a base unit in 1970) despite a substantial reduction in use of steel and iron (blue color). Opportunities clearly exist to reduce the total weight of production cars for the future by strategic applications of composite materials. Figure 2. 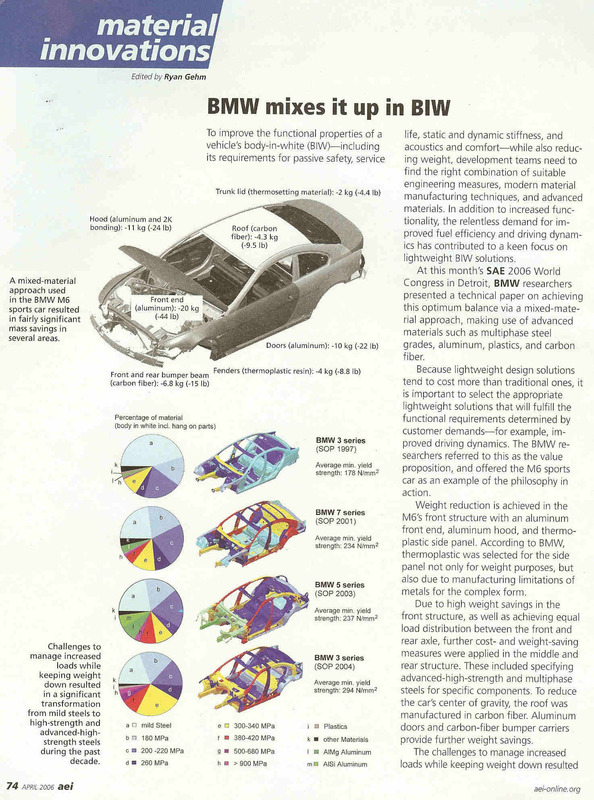 Weight distribution for different components in a typical 1994 car as compared to an ideal concept car for the future. Figure 3. 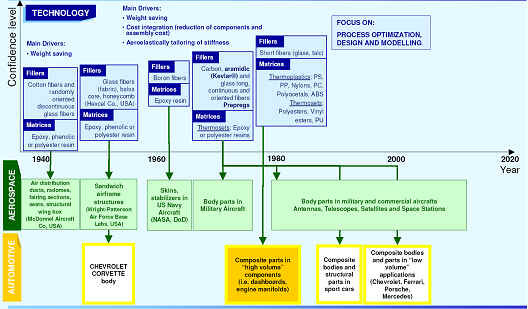 Historical evolution of the composite materials and their major applications in automotive and aerospace industries.